Opposition leader says an anti-Netanyahu bloc will be formed even if Yesh Atid chairman doesn't join it. 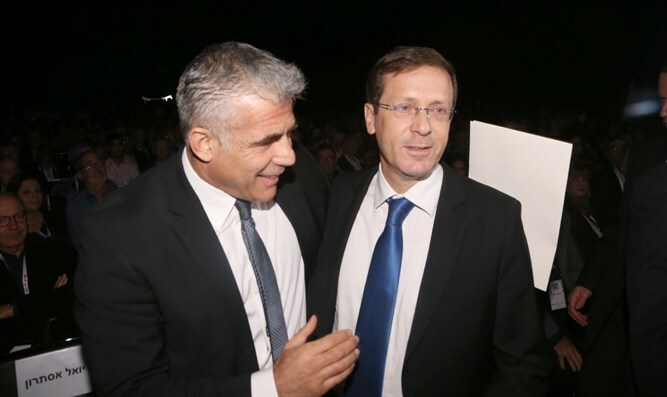 A leftist bloc will be formed, with or without Yesh Atid chairman Yair Lapid, opposition leader Yitzhak Herzog said on Sunday. Speaking to Channel 2 News on Saturday, Lapid, whose party is growing in popularity, said he would not join “a left-leaning bloc" trying to bring down Prime Minister Binyamin Netanyahu. "I won't stop the left from forming a bloc, if that's what they want to do. We're not left, we're center, and we won't form a bloc with them," he claimed. "If people think differently and behave differently, there's no reason for them to join hands just for the sake of politics,” added Lapid. Herzog on Sunday responded to the comments and said that the center-left bloc he wants to establish will become a fait accompli. "Those who determine the composition of the bloc will be those who want to replace Netanyahu," Herzog added, according to Channel 2 News, arguing that avoiding joining the bloc would weaken the power of Yesh Atid. "If Lapid does not join, his voters will abandon him and join us. The good of the country is greater than that of Lapid's," he concluded. Herzog has insisted in recent months that he will be successful in replacing Netanyahu with what he terms “a Zionist, centrist, rational bloc”. Despite past coalition talks with Netanyahu, Herzog now refuses to join the coalition, having claimed in November that the opportunity for a unity government had come and gone.